NASHVILLE, Tenn. (December 12, 2018) – Country Music Hall of Fame memberRandy Travis was honored with the Lee Greenwood Award by the 501(c)3 organization, Helping A Hero, at their Lee Greenwood & Friends concert in Houston on Monday. The concert celebrated Christmas and patriotism while honoring and raising money to build homes for wounded warriors. The event was held at Houston Baptist University on Monday evening. The reception and silent auction was followed by the concert program, featuring performances by special guests and awards; Scooter Brown Band sang songs from their album American Son including the title track, Tate Stevens performed his acclaimed song “Ordinary Angels” among others, Gavin DeGraw performed many of his hits including the fitting “Soldier” and Lee Greenwood wowed the crowd with a rendition of his iconic “God Bless the USA.” SSG Shilo Harris, a retired military veteran, received the Pillar Award. Honorary Co-Chairs of the event were the Honorable and Mrs. Ted Cruz and the Honorable Adrian Garcia. 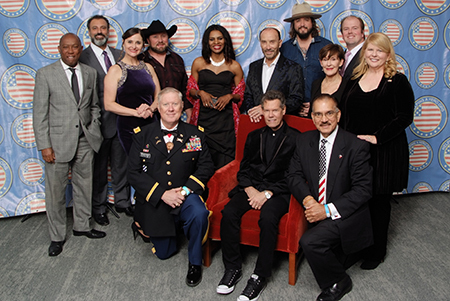 “Randy Travis has done so much for our troops over the years having done five USO tours and otherwise entertaining and honoring them in a variety of ways. We are thrilled to be able to recognize him for his continued efforts and salute his enormous talents,” said Meredith Iler, Chairman Emeritus of Helping A Hero. “As a combat veteran, it means the world to me that Helping A Hero is serving veterans who have sacrificed for our freedom. Tonight was a celebration of decades of music, with various genres represented - we were glad to be a part of it,” said Scooter Brown.